Worcester, April 24th, 2019. Free. Every person deserves to live with as much independence and confidence as possible. 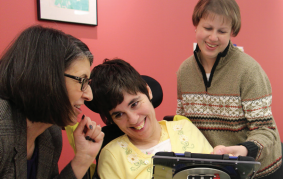 Learn more about assistive technology, meet companies and organizations from around Massachusetts and explore a world of possibilities at the 3rd Annual Assistive Technology (AT) Expo. * This year, guests will also be given the opportunity to make their own assistive technology device at the Expo for personal use. Network: Come talk with professionals and families that use AT every day.